"During the early morning market hours, larger sized boats anchor and create lanes that smaller boats weave in and out of. The waterway becomes a maze of hundreds of boats packed with mango, bananas, papaya, pineapple, and even smuggled goods like cigarettes. Sellers do not have to cry out about their goods because their goods can be seen in a distance and their cries would not be heard in the vastness of the river and the noise of boat engines. Small boats that sell beer, soft drinks and wine go among the other boats to serve market-goers and visitors. Sellers tie their goods to a tall pole so that buyers can see from a distance what they are selling." The Cai Rang - floating market in Can Tho is one of the seven floating markets in the Mekong Delta. The shops and stalls at these markets are all boats in different sizes. It is a market for wholesale, but they are also selling to individuals. 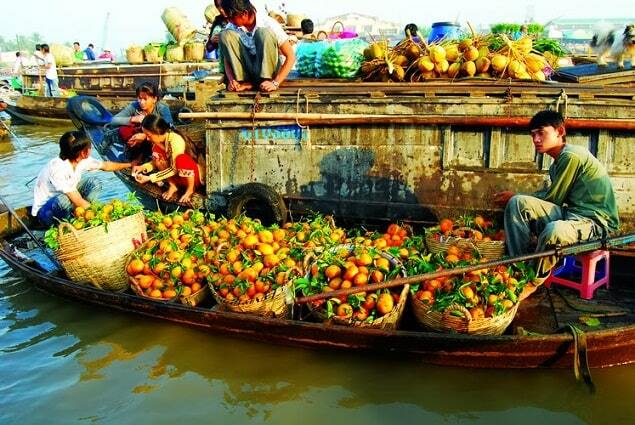 The floating markets (floating markets) are one of the most interesting sights in the Mekong Delta. When staying in Can Tho, you should definitely visit the floating market of Phong Dien This is still unspoiled. There are only few motorized boats. Sometimes operators organize a tour to the Cai Rang market, then they go to the Phong Dien and they finish the tour by going back through the backwaters by boat. 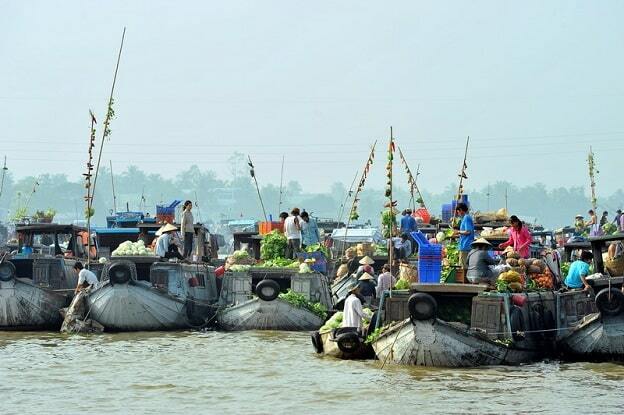 The floating market of Phong Dien is (floats) about 20 kilometers from Can Tho. Selected hotels in Can Tho are found here. The markets are part of life on and along the river. Cai Rang Floating Market is open all day, but it is busiest from sunrise till about 09:00. The main products, which are sold, are agricultural products and specialties from the town of Cai Rang, Chau Thanh District and the surrounding areas. Each boat has a long, upright pole, on which are samples of the day-products, that they are selling. 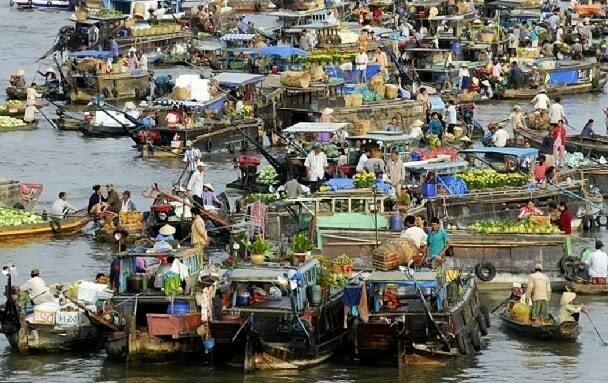 Only 6 km from Can Tho towards Soc Trang Cai Rang and you'll find the biggest floating market in the Mekong Delta. There as a bridge, where people can make photos of the boats, which are trading. It's worth to be here early in the morning, before the shiploads of tourists arrive. If you travel by boat from Can Tho the floating market that takes about 30 minutes. You can ease into the day and see life awakening on the shores of the river. Do you come by car / taxi, it takes just 10 minutes to reach the market. In the early morning the boats of larger sizes anchor as the first. The smaller boats can then navigate between the large boats to do some shopping. The waterway becomes a maze of hundreds of boats, all packed with mango, banana, papaya, pineapple, rice bags and even smuggled goods such as cigarettes. Sellers do not have to shout their wares to prices. To which products are involved, they can already see from afar on the pole and they can't hear the seller by the noise of the engines. Some small boats are selling beer, wine and soft drinks. They sail among the other boats in order to serve the market people and tourists. Which boat is fully loaded with plenty of seasonal products. From afar it seems only a mass of boats on the river, but coming closer, you can watch all the activities of the floating market. Vendors throw vegetables and fruits from one boat to another. Melodic phrases you hear them yelling to each other. It is an impressive event. The big tourist boats can't really navigate through the market, but sail along. Tip: make sure you're not on a tourist boat but rent a small boat for 2 to 4 people. If you do that, it's fun to do a private tour, because you will see and hear a bit more. Travelling across the river in Vietnam remains a concatenation of many impressions. You cab see, how people live directly on the river. A variety of boats and cargo will pass you by. You can also see how these people live aboard. Often you see the washed clothes behind the boat and their whole household, which is not so much. The floating market is really interesting point and from a boat you're on top. Later on, I heard that this market tradition is rapidly disappearing. Largely as a result of improved roads and access to public transportation.